Incredibly everyone made it to the bunkhouse on Friday night. Heavy snow on the A82 and a variety of accidents made it a white knuckle ride for those of us who had to leave after work and brave the conditions. Saturday morning saw an early start for the climbing parties. Fiona, Mike, Tim & Martin headed for the "Climbers Gondola" on Aonach Mor where enjoyable ascents of "Western Rib" and "Golden Oldy" were made. F & M were particularly pleased that the skiing was busy as they sprinted down the hill to catch the last gondola but at least the 1/2 hour wait in the queue allowed time for cakes & coffee. Alison and Fiona opted for a different venue and headed to Stob Coire nan Lochan. Opting to follow a furrow plughed by top climber Ian Parnell they had a good effort on a more esoteric route "Financial Times". Chris & Katrina were also at Aonach Mor and had an enjoyable day of downhill skiing. I had to admit that walking our climb off the snow did look good. 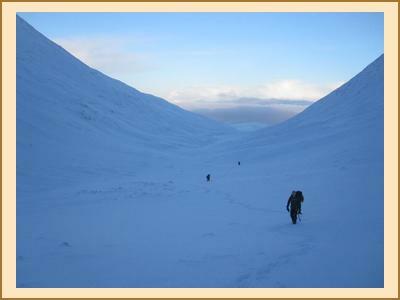 The walkers / snow shoers headed for the Mamores where various summits were bagged in great looking conditions. The highlight of the weekend was the spectacular failure of the power on Saturday night. This prompted a mass assault of the chippie whilst the owner and scottish hydro scratched their heads as to what was wrong. We wont reveal who turned the oven on right when the power went off, I'm sure it was just a coincidence. Sunday saw a mass departure to the hills. Alison and Kenny managed to combine both snow shoeing and cross country skiing. Surely the new pursuits of the season in the EMC? Dave and Pauline managed another Mamore whilst Mike & Fiona made a half assed attempt at Na Gruachain before turning back due to deep snow. Another big party headed to Beinn Dorain whilst Claire and Antti went ski touring on the neighbouring Munro Beinn Mhannach. 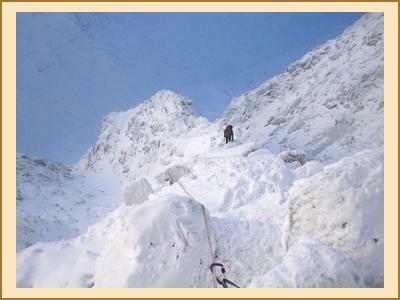 Chris and Katrina had a big day climbing on Aonach Mor chosing a more esoteric route due to queues on the classics. Thanks to everyone braving the difficult conditions. It was a great meet and the bunkhouse is definitely much improved following renovations.